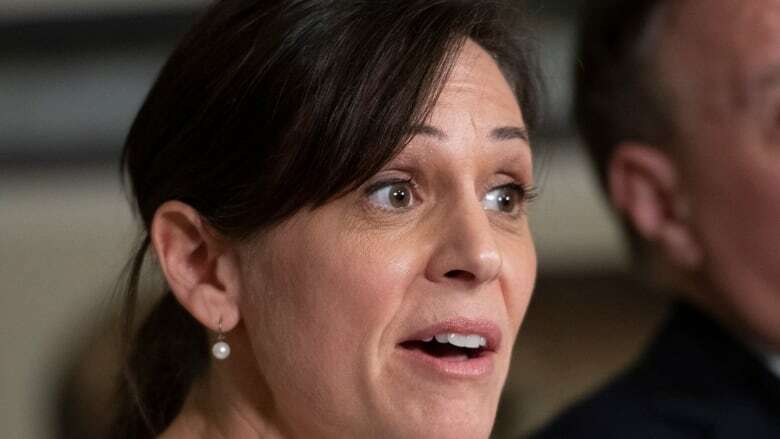 Isabelle Charest, newly appointed to the job, reiterated Wednesday the Muslim head scarf does not correspond to her values and is not a way for women to flourish in society. Quebec's newly appointed minister responsible for the status of women is standing by her position that the Muslim hijab is a symbol of oppression. Speaking to reporters after being named to the portfolio Tuesday, Isabelle Charest said the head scarf "is not something that women should be wearing." Charest didn't back down from those comments Wednesday, though she acknowledged that some women choose to wear the hijab themselves, and she "respects their decision." "When they are dictated by a religion on what they have to wear, for me it's a lack of liberty, and it doesn't meet my values," Charest said. Pierre Arcand, interim leader of the Opposition Liberals, said tolerance and calm are needed in the debate prompted by the CAQ government. He said his party favours freedom of choice. Québec Solidaire's co-spokesperson Gabriel Nadeau-Dubois said Charest's comments were "divisive." He said the minister for the status of women should seek to build "consensus" rather than stir conflict. Charest, a former Olympic short-track speed skater, was elected for the first time on Oct. 1. She is also junior education minister. Justice Minister Sonia Lebel was formerly responsible for the status of women, but gave up the position Tuesday. The CAQ government is preparing to introduce legislation banning public workers in positions of authority from wearing visible religious symbols, including the hijab.